This Friday we would like to share a wine label project we have recently completed. It started off with recreating the Kleinberg Wine Estate logo. They wanted to incorporate their own sketch so we had to edit and clean it up as best we could because the quality of the original scan wasn't very high. Next, we redesigned their wine label. They wanted something simple and clean that incorporated their new logo, and they wanted each label colour-coded to their specified colours. 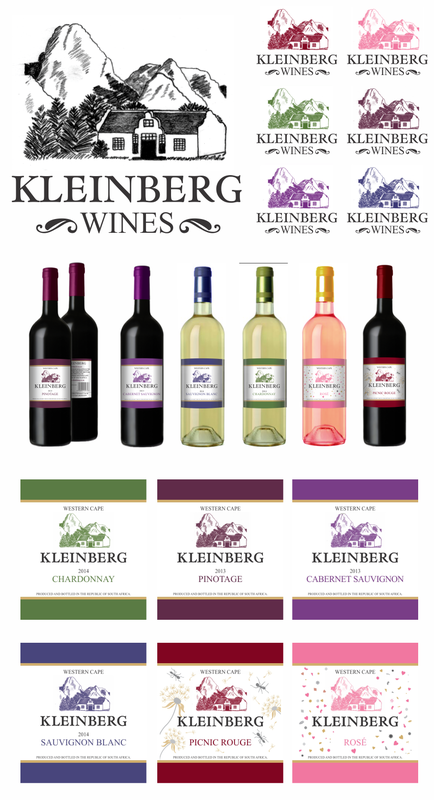 There are six labels altogether: Chardonnay, Cabernet Sauvignon, Sauvignon Blanc, Pinotage, Picnic Rouge and Rose. We also designed the labels for the backs of the bottles including their barcoding. Below you can see the logo, graphic simulations of the labels on the bottles (not the client's actual bottles), and the individual front labels. We're looking forward to seeing the labels on the products and in the shops!